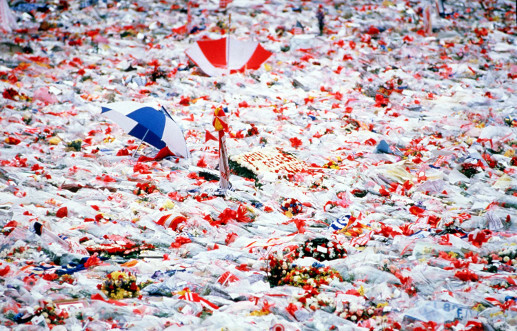 On the 29th anniversary of the Hillsborough tragedy, this collection of images powerfully and poignantly expresses how and why the 96 fans who lost their lives on April 15, 1989 will never be forgotten. 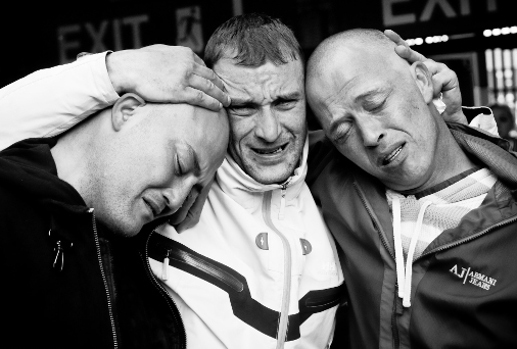 In the days following the disaster, mourners flocked to Anfield to seek solace at the club's home. The pitch transformed into a shrine, covered in scarves, flowers and placards. 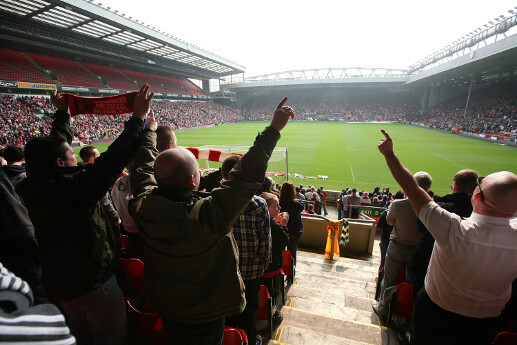 On April 15, 2009, Anfield opened its doors to the masses as the annual memorial service was held in memory of the 96. The ground was packed on a poignant afternoon. The photo below depicts one of the many gatherings which took place in the aftermath of the disaster. 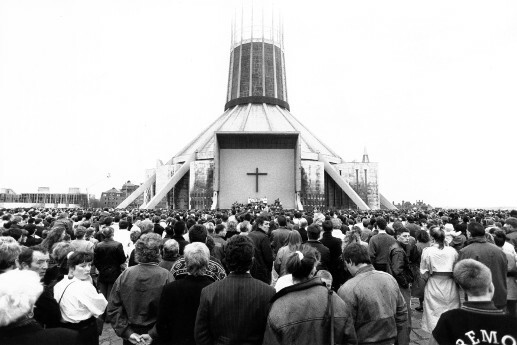 Here, people gathered at the city's Metropolitan cathedral. 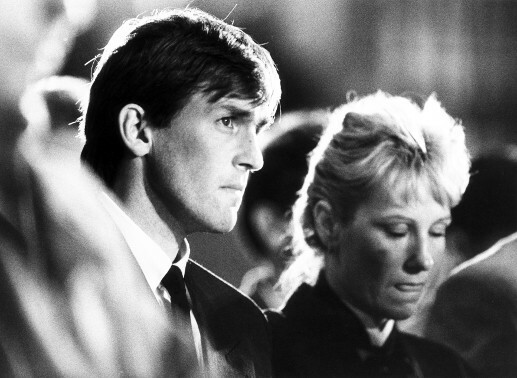 Liverpool manager, Kenny Dalglish, pictured here with his wife Marina, joined the rest of the Liverpool squad in attending as many of the funerals as possible. 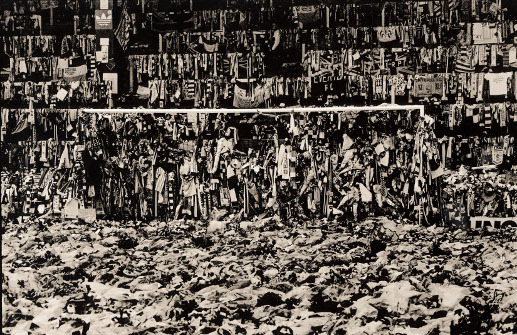 Below is another image of Anfield in the days following April 15, 1989 - and it conveys perfectly the sheer amount of scarves which were left at the ground and draped on the Kop goal. Photo: Dave Sinclair. 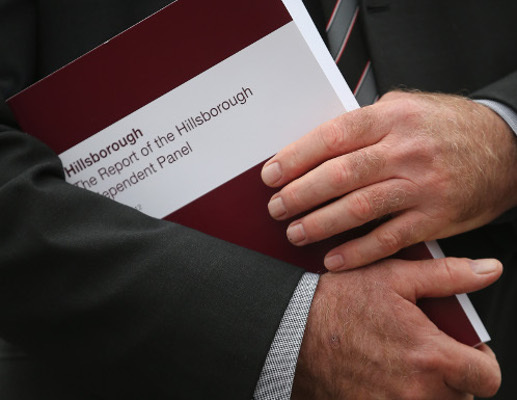 Held here in the hands of Steve Kelly, whose brother Michael died at Hillsborough, the Independent Panel's report into the disaster was published on September 12, 2012. 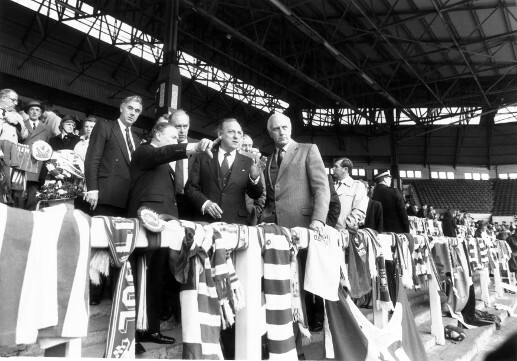 Lord Justice Taylor, seen here surveying the scene at Anfield in the days after Hillsborough, would lead an investigation into the disaster, published in 1990. 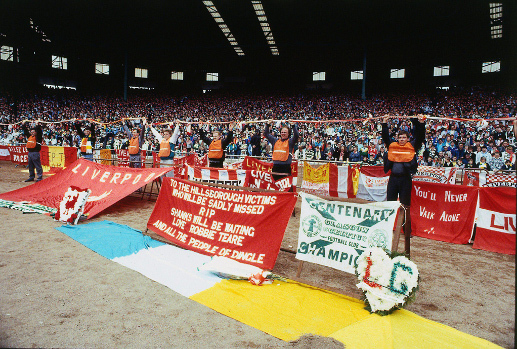 Liverpool's first game following Hillsborough was organised by Celtic at Parkhead. 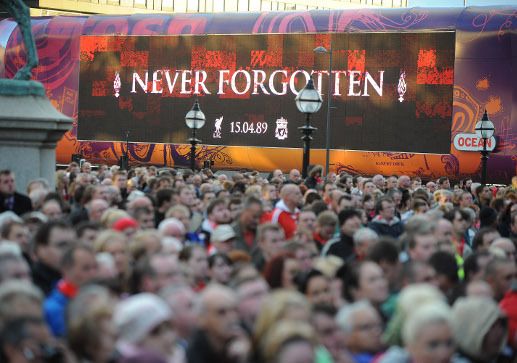 More than 60,000 turned out to show their support as 'You'll Never Walk Alone' rang out in fitting tribute to the 96. Photo: Liverpool Echo. 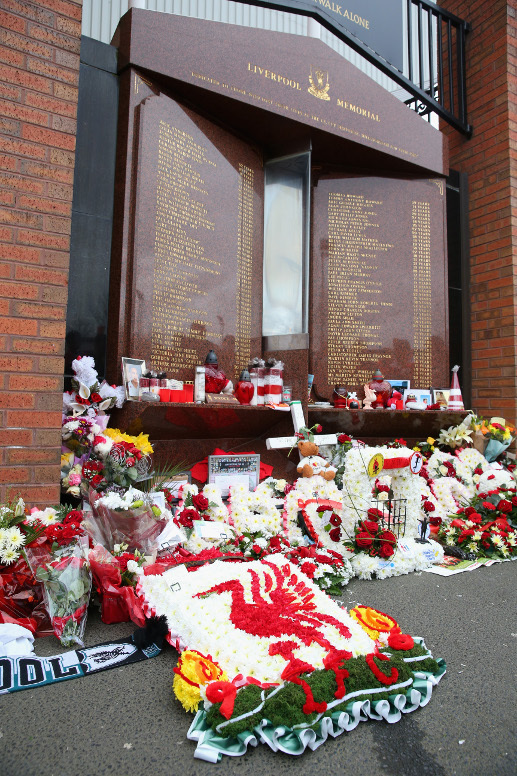 The special memorial with the names of the 96 chiselled into its marble, situated on Anfield Road next to the Shankly Gates, became the focal point for many fans wishing to pay their respects. It was placed in a new, dedicated home at the stadium following the expansion works on the Main Stand. 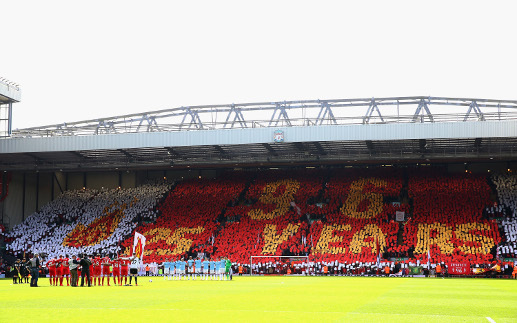 Prior to Liverpool's match against Manchester City on April 13, 2014, supporters on the Kop paid their own tribute to the 96, holding a mosaic in place which read '96 - 25 years'. 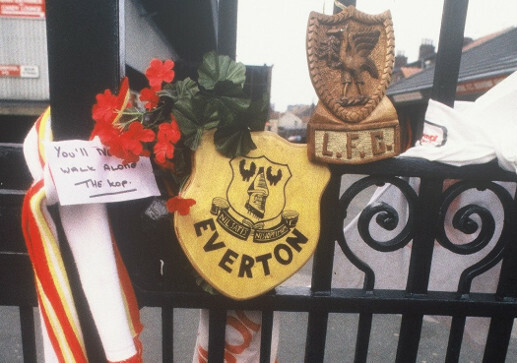 In the days that followed the disaster, tributes were left at the Shankly Gates on Anfield Road. 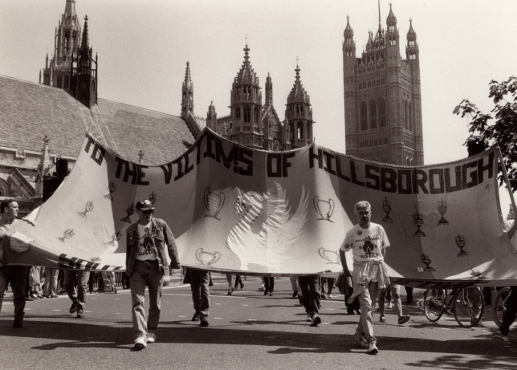 One of the first to be put in place was a show of support from Liverpool's neighbours, Everton. 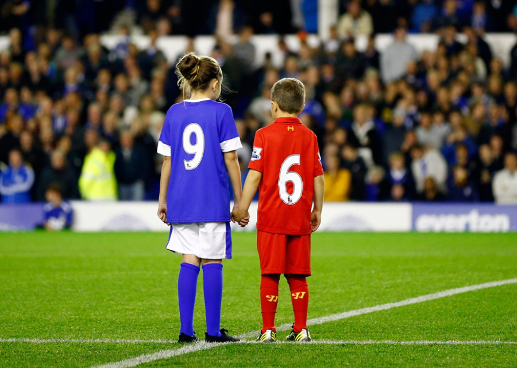 On September 17, 2012, five days after the publication of the Hillsborough Independent Panel's report, Everton paid a poignant Goodison Park tribute to the Reds as a symbol of their ongoing support. A vigil took place in Liverpool city centre on September 12, 2012 to mark the release of the panel's report on the disaster and its aftermath. 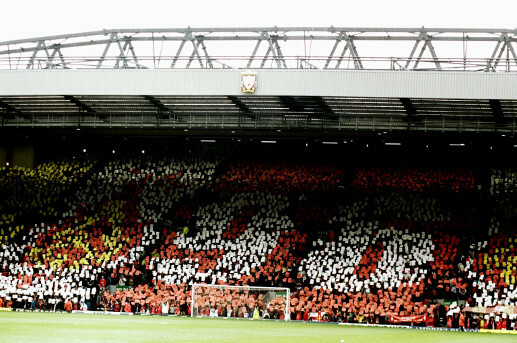 The Kop became the focal point once again to mark the 10th anniversary of the disaster, prior to kick-off in Liverpool's match against Aston Villa on April 17, 1999. Families and campaigners march on Parliament holding a special flag made in honour of the 96, which adorned the Kop for memorial services. Photo: Dave Sinclair. 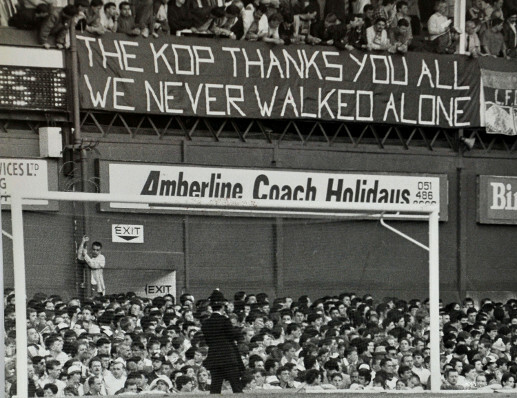 Support for the families poured in following the disaster - and in their first competitive game since April 15, 1989, against Everton at Goodison Park, Liverpool fans expressed their thanks. Photo: Liverpool Echo. 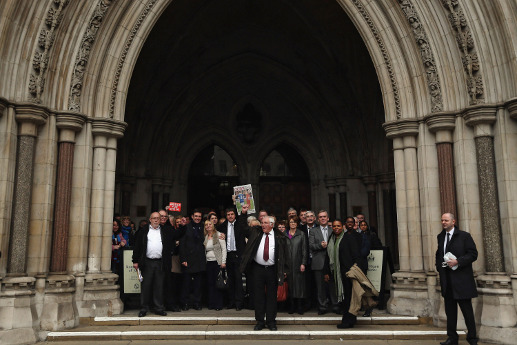 Another landmark moment was reached on Wednesday December 20, 2012, when the original inquest verdicts of the Hillsborough disaster were quashed at the High Court. Brian Roberts' powerful image was taken at the memorial service which marked the 20th anniversary of the disaster in April 2009. On May 20, 1989 - little more than a month after the disaster - Liverpool and Everton met at Wembley to contest the FA Cup final. 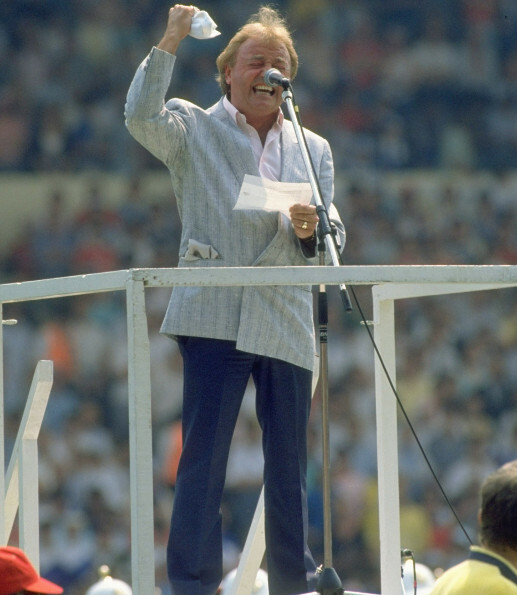 Emotional scenes unfolded pre-match as Gerry Marsden sang 'You'll Never Walk Alone'. 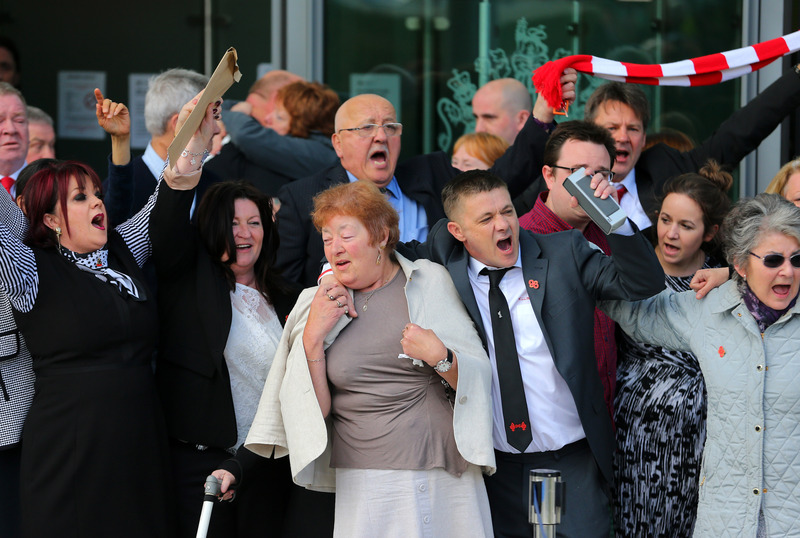 In April 2009, families of the 96 victims of Hillsborough were awarded the Freedom of the City. 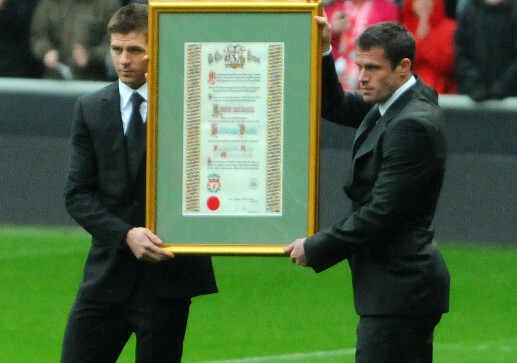 Steven Gerrard and Jamie Carragher were on hand at the year's memorial service to present the families with the honour. Andy Burnham, the culture secretary, addressed the crowd at the memorial service to mark the 20th anniversary of the disaster - and the MP was greeted with an emotional response from those present. Photo: Liverpool Echo. 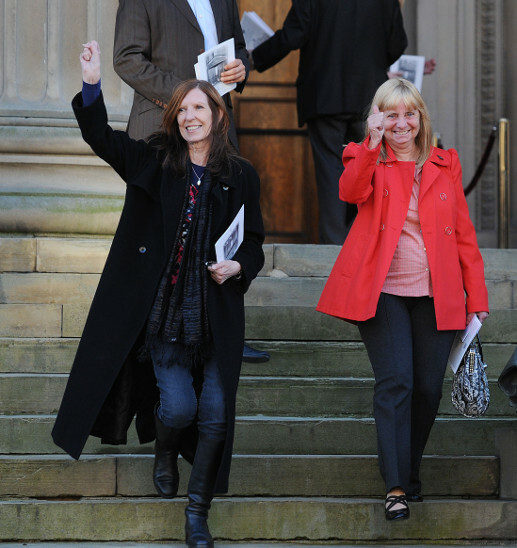 Anne Williams and Margaret Aspinall on the steps of St George's Hall following the publication of the Hillsborough Independent Panel's report into the disaster. Football fans from around the world have placed their scarves at Hillsborough memorials since the day of the disaster. 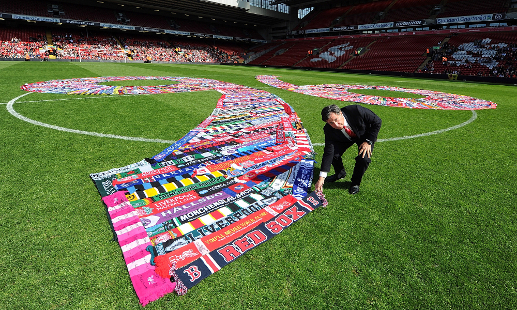 At the 25th anniversary service, more than 3,200 scarves were displayed in the shape of the number '96' on the Anfield turf as a global signal of unity. 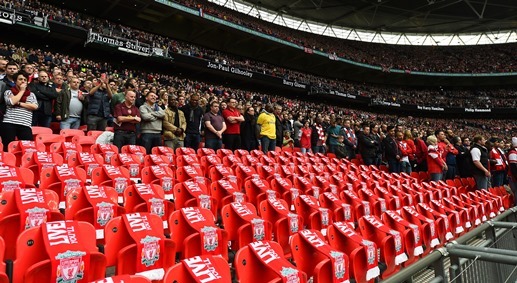 Prior to the FA Cup semi-finals at Wembley in April 2014, 96 prominent seats were left empty in tribute to those who died at Hillsborough. Tributes were made across the country. 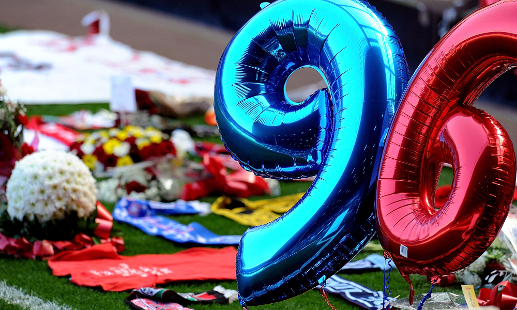 25 years on from the tragedy, Anfield hosted an emotional and passionate memorial service. 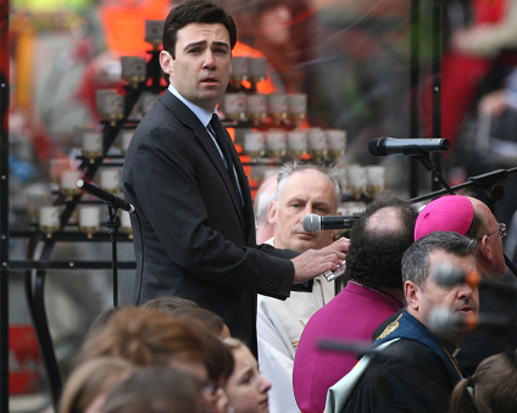 Brendan Rodgers and Roberto Martinez delivered poignant speeches as the city stopped to remember the 96. 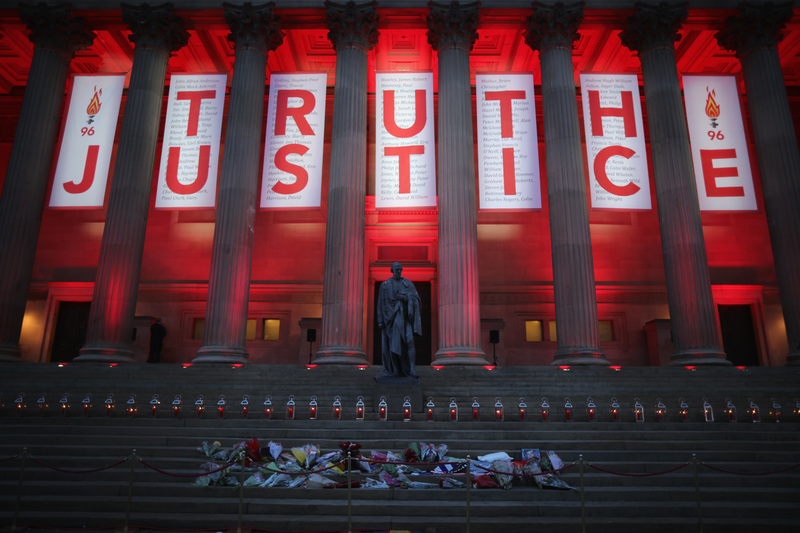 On April 26, 2016, the longest-running inquest in UK legal history concluded in Warrington with determinations of unlawful killing in the case of each and every one of the 96 victims of Hillsborough - a landmark day in the long battle for justice. 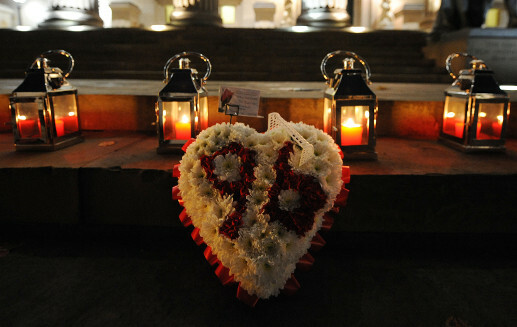 A civic event was held at St George's Hall the day after those momentous inquest verdicts, with the people of the city coming together in their thousands to remember the 96 and pay tribute to the families, survivors and campaigners. 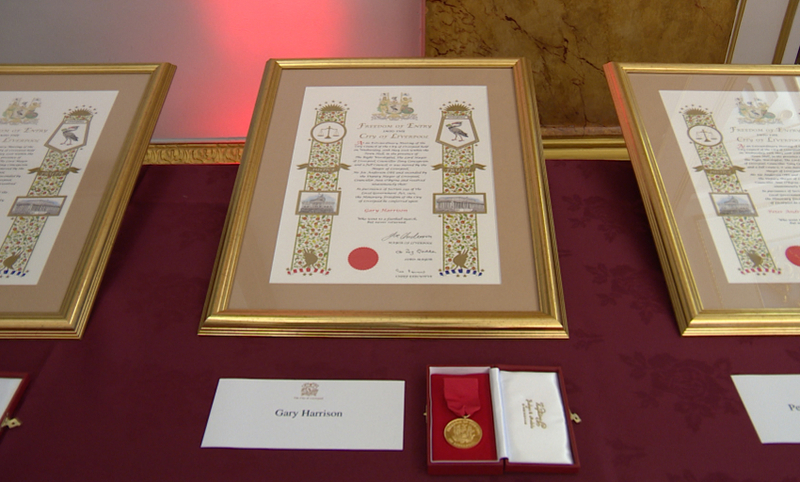 In September 2016, the 96 were posthumously awarded the Freedom of the City of Liverpool, and their families presented with a specially designed scroll and a medal inscribed with the name of their loved one. 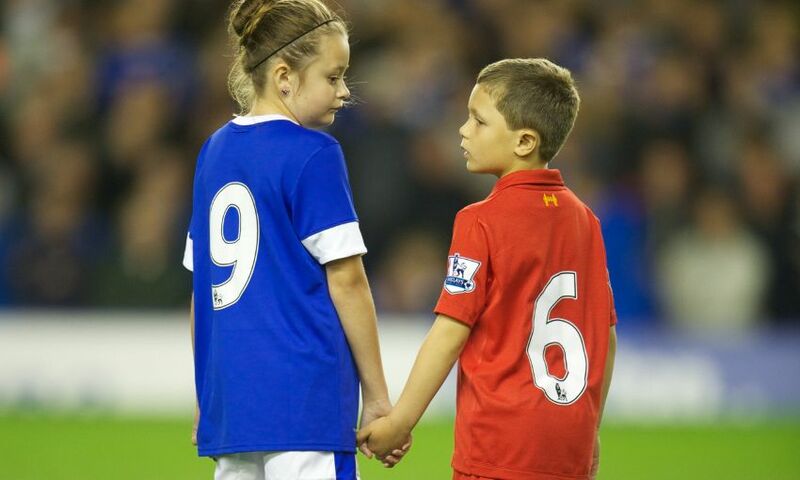 96 children, men and women lost their lives at Hillsborough on April 15, 1989. We will never forget them. The thoughts of everyone at Liverpool FC, as always, are with the 96, their families, survivors and all affected by the tragedy.